Cortaderia jubata is a large tussock grass which is a substantial threat to the ecological quality of preserves, particularly in coastal and grassland sites. It has broad habitat requirements and grows vigorously, but the chief reason for its success as an invader is its prolific production of seed. Even a few plants have a large potential impact because the seeds are light and wind-dispersed. Seeds may also be dispersed by water and machinery. Peterson (1988) states that Cortaderia jubata is a large tussock grass (tussock grasses grows in mounded tufts) with most of its leaves near the base and narrow, attenuated blades. The panicles (loosely branched, pyramidal flower clusters) are large, terminal, and plume-like. Spikelets are several-flowered, with internodes of the rachilla jointed, the lower part glabrous (smooth), and the upper part bearded. Glumes (the empty bract at the base of a grass spikelet) extend beyond the lower florets. C. jubata possesses a breeding system termed agamospermous apomixis which allows plants to asexually produce seeds, i.e. without fertilisation, despite the fact that all plants are female (Costas-Lippmann 1979, in Chimera, 1997). Distinctive features of C. jubata are huge, nodding pinkish or purplish flower plumes (later turning creamy white), and dark green, 1-cm-wide, drooping leaves with razor-like margins. Flower stems rise up to 3 times higher than the clump of foliage. Peterson (1988) notes that all the seeds produced from a given plant are genetically identical because of apomictic reproduction, which does not require fertilisation. Populations of Cortaderia generally have little variability in isozyme content, even among plants collected from diverse habitats and geographic locations. This low genetic variability is also related to apomixis. Optimal seed germination is obtained with high soil moisture, temperatures of around 10 degrees C, and at least some light exposure (Costas Lippmann 1976, in Peterson, 1988). Seedlings can germinate and become established in a variety of different soil types, including those derived from serpentine rock (Peterson, 1988). The normal lifespan of the plant is 10 to 15 years (Pleasants and Whitehead 1977, in Peterson, 1988). Peterson (1988) states that the attractive plumes of Cortaderia have made it a popular landscaping plant for many years. It has also been used as a forage plant for cattle in California (Lemon and Taylor 1949, in Peterson, 1988) and New Zealand (Pleasants and Whitehead 1977, in Peterson, 1988). It provides green forage during dry summer months and can be used as a substitute for hay. It can be grazed to within 0.3 to 0.5m of the base of the plant without severe damage. Peterson (1988) states that Cortaderia jubata becomes established most easily in wet, sandy soil without existing vegetation. However, it has broad habitat requirements and will grow vigorously in nearly any soil, under low or high moisture regimes, and in full sun or dense shade (Cowan 1976, in Peterson, 1988). Cortaderia flourishes mostly in coastal areas and probably needs at least some summer moisture from fogs and freedom from freezing temperatures. Several consecutive nights of frost will generally not kill the plant, but can severely damage it. It colonises on foreshores, roadsides and wet areas. It grows best in full sunshine with adequate water, but can tolerate rather severe drought conditions once established (Potter 1970, in Peterson, 1988). Some Cortaderia jubata populations consist entirely of pistillate (female) plants that form seed without the necessity of pollination (apomixis) (Costas Lippmann 1976, in Peterson, 1988). Nearly all the ovules produced can therefore develop into viable seeds (caryopses) (Costas Lippmann 1979, in Peterson, 1988). This results in a huge seed output of up to millions of seeds per plant (Cowan 1976, in Peterson, 1988). Much of the invasive potential of pampas grasse arises from its ability to produce thousands to millions of wind-borne seeds per year over 10–15 years (Chimera 1997). Peterson (1988) states that it was first cultivated in France and Ireland from seeds collected in Ecuador. It was used as an ornamental plant for some time. Recommended citation: Global Invasive Species Database (2019) Species profile: Cortaderia jubata. Downloaded from http://www.iucngisd.org/gisd/species.php?sc=375 on 22-04-2019. Peterson (1988) states that Cortaderia jubata is highly competitive with native plants once seedlings become established and is a substantial threat to the ecological quality of preserves, particularly in coastal and grassland sites. Its rapid growth and accumulation of aboveground and belowground biomass allow it to acquire light, moisture, and nutrients that would be used by other plants. It can be damaging even at low densities because of the amount of cover it can occupy. Particularly threatened habitats include coastal sand dunes and inland sand hills that contain a number of rare and endangered plant species. PPC (1998) cites that on roadsides, C. jubata can seriously hamper visibility, while its sharp leaves can cause serious cuts to humans. It is also a fire hazard because of the large amount of dry matter it produces, and it harbors vermin such as rats, mice, possums, and rabbits. Additionally, C. jubata seeds stick to fruit such as kiwifruit, seriously degrading fruit quality. Peterson (1988) cites that there is good opportunity for recovery of native plant populations if Cortaderia jubata is controlled with a strict management program. \r\nPreventative measures: A Risk assessment of Cortaderia jubata for Australia was prepared by Pacific Island Ecosystems at Risk (PIER) using the Australian risk assessment system (Pheloung, 1995). The result is a score of 22 and a recommendation of: reject the plant for import (Australia) or species likely to be a pest (Pacific). \r\nPhysical: Physical removal of the plants is effective if they are small enough, but this method can be quite labour intensive. Good success has been obtained by physically removing the plants whereby a rope or chain is tied around plants and they are pulled out of the ground with a vehicle. Although effective, this is labor intensive. Fire has also been suggested as a method to eliminate foliage for the later mechanical removal or chemical treatment of the plant. According to George Gray (1992), Associate Resource Ecologist for the California Department of Parks and Recreation, fire will not kill pampas grass, but makes it unhappy. 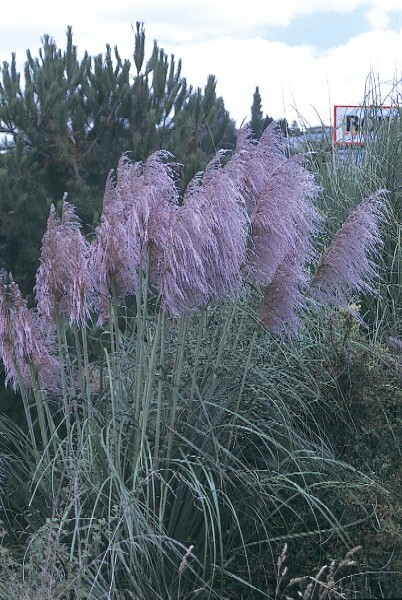 Madison (1994), however, found that the high silica content in the leaves of pampas grass acted as a fire retardant and fire was not very effective in eliminating the foliage. \r\nChemical: A number of chemical treatments are also effective and may be more practical for severe infestations. Monitoring is definitely needed to document population trends in and adjacent to preserves. The effects of the weed on native plants should be monitored as well as the effectiveness of management efforts to eradicate it. If populations are found to be increasing rapidly, an intensive effort to control its spread is necessary. If an eradication program using an herbicide (Roundup) is initiated, treatments should be followed by evaluations of effectiveness. The emphasis of most programs has been to eliminate the largest plants first to reduce the potential for seed dispersal. \r\nBiological: In New Zealand pine plantations Cortaderia is controlled by cattle grazing (Wilcox, 2003). Informations on Cortaderia jubata has been recorded for the following locations. Click on the name for additional informations. Chimera, 1997. HNIS Report for Cortaderia jubata. Hawaiian Ecosystems at Risk Project. Available from: http://www.hear.org/hnis/reports/HNIS-CorJub.pdf [Accessed 8th January 2004]. Collins, J.N, May M, Grosso C. 2003. Pampas grass Cortaderia jubata, Cortaderia selloana. Practical Guidebook to the Control of Invasive Aquatic and Wetland Plants of the San Francisco Bay - Delta Region. Available from: http://legacy.sfei.org/nis/pampasgrass.html [Accessed 22 May 2010]. Coulston, G.J., 2002. Control of invasive plants on the Poor Knights Islands, New Zealand. In Turning the tide: the eradication of invasive species: 79-84. Veitch, C.R. and Clout, M.N.(eds). IUCN SSC Invasive Species Specialist Group. IUCN. Gland. Switzerland and Cambridge. UK. Summary: Report on distribution, impacts and management in New Zealand. OCA (Olympic Coordination Authority) Undated. Once a Garden Fashion Statement Pampas Grass (Cortaderia jubata) Australia. Summary: Short report on description, habitat, dispersal methods and control. Available from: http://www.hear.org/pier/species/cortaderia_jubata.htm [Accessed 5 February 2003]. PPC (Plant Pest Control) 1998. Land Plant Pests: Pampas grass: Cortaderia selloana, C. jubata Hawke s Bay Regional Council, Newzealand. Summary: Summary on description, similar species, impacts and management. Taranaki Regional Council. 2003. Common pampas/Purple pampas (Cortaderia sellona / Cortaderia jubata). The Pest Plant Management Section. Christchurch City Council (CCC) Undated. How to distinguish between - pampas grass and toetoe Christchurch, New Zealand. Summary: Brief summary on distinguishing features. DOFAW (Division of Forestry and Wildlife) Undated. Hawaii s Most Invasive Horticultural Plants: pampas grass Cortaderia jubata and Cortaderia selloana Honolulu, Hawaii. Summary: Very short report on description and habitat. Wilcox, M. D. 2003. Cortaderia jubata. In PlantWorld - a compendium of plants of the world. Mangere Bridge, Auckland, New Zealand (unpublished).